Massive thanks to all of you who supported us through Kickstarter, and to everyone out there who has been so patient. We want this out as much as you do!!! UK metallers MORTAD have launched a Kickstarter campaign, for donations towards the shooting of music videos for their upcoming album, which is due for release this year. For more information about how to donate and to see some clips about recording the new album, visit the Kickstarter page at this location. There are 27 days left of the campaign if you wish to contribute. Metal Shock Finland are proud to announce a Special Halloween Competition for all Metal Shock Finland readers. 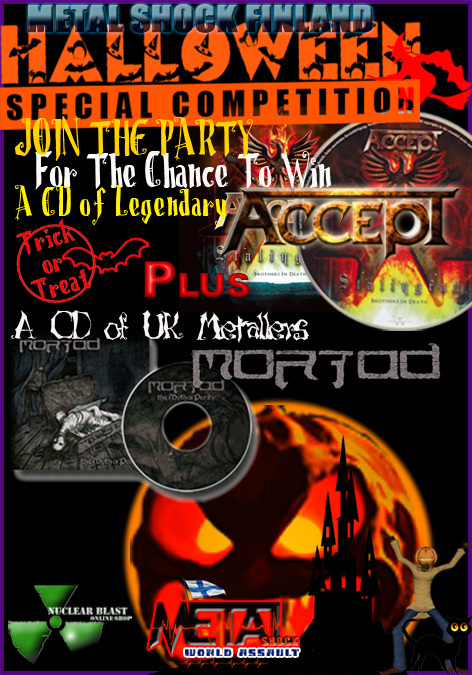 Join our Halloween party where you can have the chance to win a CD of the latest album of legendary heavy metallers ACCEPT plus a CD of the newest album, “The Myth Of Purity” by UK metallers MORTAD . The competition will close at midnight on Halloween and the winners will be announced on the Metal Shock Finland website and official facebook page. If you want to be a winner, you just need to write a brief description of “What Halloween means to you?” So fill in all requested details on the forms below. Legendary Teutonic heavy metallers ACCEPT released their newest masterpiece album, “Stalingrad” in April 2012 via Nuclear Blast Records. The new songs still capture that great classic ACCEPT sound. The band are currently on their European fall tour and they are seriously shaking the ground with their metal awesomeness. To know more about ACCEPT tour dates click HERE. UK metallers MORTAD released their debut album “The Myth Of Purity” earlier this year with producer Russ Russell. The album received rave reviews and was supported by a recent successful UK tour, which gained many new fans. MORTAD have already begun working on a new album, so stay tuned! For more info about MORTAD click HERE. What Halloween means to you? London, England-based, female-fronted metallers MORTAD are seeking a second guitarist. Interested parties can contact the group at MortadAuditions@gmail.com. More information is available on the flyer below. MORTAD‘s “The Voice” video can be seen below. The song comes off the band’s debut album, “The Myth Of Purity”, which was made available with the February 2012 issue of Metal Hammer magazine. The CD, which will receive a more “official” release later in the year, was recorded last October with producer Russ Russell (NAPALM DEATH, DIMMU BORGIR, EVILE). “The Voice” honors the memory of Neda Agha Soltan, a young Iranian woman who was killed during the pro-democracy up risings in Iran in on June 20, 2009. MORTAD will release a follow-up video explaining the song, the making of the video, Neda‘s life and the Iranian freedom movements on June 20. MORTAD will enter the studio in November with Russ Russell to begin recording its sophomore album for a 2013 release.